This attack is the largest elimination of protected public lands in U.S. history. It’s official. President Trump signed away almost two million acres from Bears Ears and Grand Staircase-Escalante National Monuments today with a disastrous executive proclamation. This attack amounts to the largest elimination of protected public lands in U.S. history, putting tens of thousands of archeological sites, Native American sacred sites, and recreational lands at risk. Friend of The Trust for Public Land, we need you to act now before it’s too late: Urge Congress to overturn this executive proclamation. The purpose of National Monument designations is to create permanent protections for America’s most special places. President Trump’s executive proclamation undermines that very concept, and will have MONUMENTAL consequences for our public lands. Archeological sites like Cedar Mesa will have a renewed risk of looting and desecration, the grand sandstone buttes of the Valley of the Gods could be at risk of reckless development, and the 100 million year old sandstone Wahweap Hoodoos could be irreversibly damaged. Worse yet, the Trump Administration has already indicated that this assault on our public lands will not stop with Utah’s iconic landscapes. Eight other national monuments, including the desert oasis Gold Butte and enchanting Katahdin Woods and Waters, remain on the chopping block. 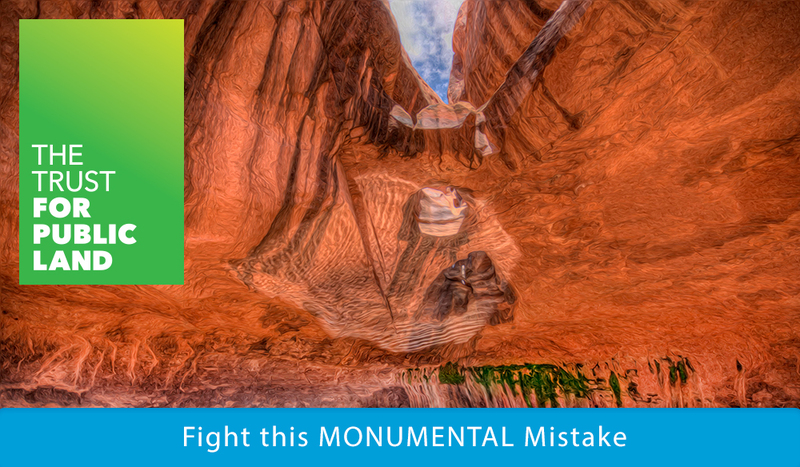 Our national monuments are not safe, but with your help, we can beat back this attack by taking the fight head-on in Congress. Take action right now to stand up to President Trump’s executive proclamation so Bears Ears and Grand Staircase-Escalante remain protected. Thank you for speaking up for our public lands at this critical time. You have received this email because you have subscribed to The Trust for Public Land as . Have something you'd like to share with us? We'd love to hear from you.